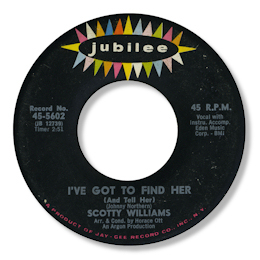 New York based Scotty Williams is another of those figures who made a couple of good 45s but never hit the big time. But as with so many other artists in a very crowded marketplace his vocal talent deserved better. Three of his four tracks are uptempo and have been latched onto by the dance crowd – but the grit in his voice, especially on “In The Same Old Way”, and his sense of timing mean that they are far from just DJ fodder. 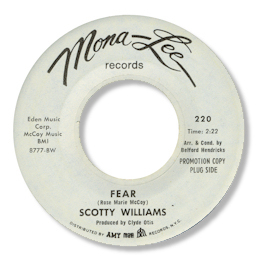 “Fear” was also cut by the Platters as “Fear Of Losing You” (Musicor 1341) in 1968 but Williams version is the one for me. But far and away his best cut is the super deep I’ve Got To Find Her which is a big city ballad par excellence. A strong piece of songwriting by Johnny Northern forms the bedrock for an anguished, desperate performance from Williams, matched by a very sympathetic arrangement from Horace Ott. A real winner.